DONETSK, May 13. /ITAR-TASS/. Soldiers of the so-called Ukrainian National Guard have surrounded the village of Oktyabrskoye located 15 kilometers from the city of Kramatorsk in eastern Ukraine’s Donetsk Region, a spokesman for Kramatorsk militia said Tuesday. Armored vehicles are arriving at the site, and at least three Ukrainian armed forces helicopters have landed there, he told ITAR-TASS. The armed clash started when a convoy of Ukrainian law enforcers’ armored vehicles was going along a road near Oktyabrskoye. “Militia forces blocked the road, two units of hardware were destroyed — an armored personnel carrier [APC] and a vehicle with ammunition. The second vehicle caught fire and rounds of ammunition and shells that the National Guard was carrying in it were exploding for half an hour,” the militia spokesman said. “During the fight, peaceful residents of Oktyabrskoye went downstairs to basements of their houses trying to escape,” he added. The settlement was blacked out, he said, “as power transmission lines were damaged in clashes”. Shots were heard, including from large-caliber guns. 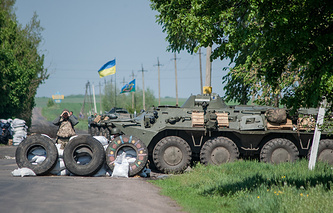 As of now, Oktyabrskoye is completely surrounded by National Guard forces. Separate detachments are involved in a mopping-up operation in the city. Local residents say they received threats of violence should they tell someone about the law enforcers’ actions. The situation in Ukraine is far from calm after a coup occurred in the country in February following months of anti-government protests, which often turned violent. New people were brought to power amid riots as security concerns forced President Viktor Yanukovych to leave Ukraine. After Crimea’s accession to Russia, protests against the new Ukrainian authorities erupted in Ukraine’s Russian-speaking southeastern territories, with demonstrators seizing some government buildings and demanding referendums on the country’s federalization. The Kiev authorities have been conducting what they call an antiterrorism operation in eastern Ukraine. 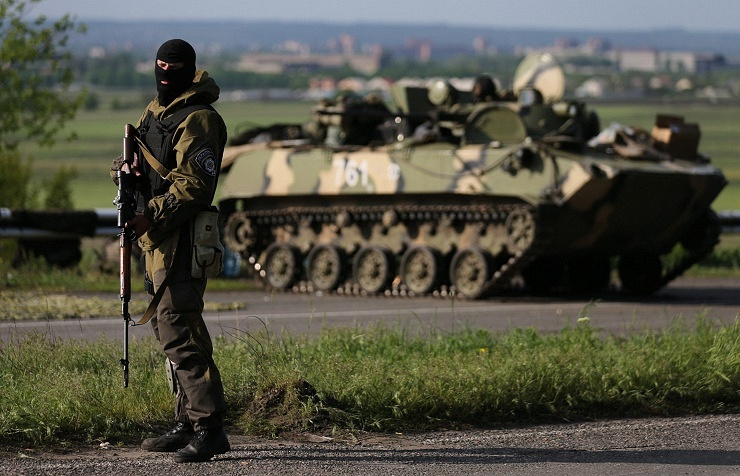 Russia has condemned the operation, apparently aimed to clamp down on Ukrainian nationals supporting federalization. At least 48 people died and more than 200 were injured on May 2 in clashes and a fire in the southern Ukrainian city of Odessa after radicals set ablaze the Trade Unions House, where pro-federalization activists hid, and a tent camp where activists were collecting signatures for a referendum on federalization and for the status of a state language for Russian. In the city of Mariupol in the Donetsk Region, Ukrainian law enforcers opened fire from armored vehicles on participants of a rally held in honor of Victory Day on May 9 who gathered near the building of the local Interior Ministry department and who were trying to prevent its storm. Nine people died and 42 were injured. The eastern Ukrainian Donetsk and Luhansk regions held referendums on May 11, in which most voters supported independence from Ukraine.